The Flying Dutch will be seeking to continue a tradition of excellence with an extra incentive this season. 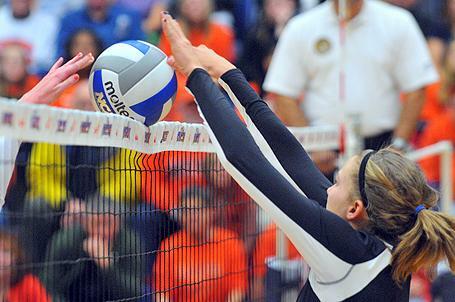 Hope College will be hosting the finals of the NCAA Division III volleyball championships in mid-November. Coach Becky Schmidt's Flying Dutch will be seeking to advance to the post-season tournament for a fifth consecutive year. A year ago the Flying Dutch were nationally ranked throughout the season, The team were runnersup in the Michigan Intercollegiate Athletic Association (MIAA), surpassed 20-wins for a school-record seventh consecutive year with a 25-7 record. Hope's winningest volleyball coach, Schmidt will be guiding the Flying Dutch for her ninth season. Co-captains of the 2012 team will be senior Greer Bratschie of Grand Rapids (East Grand Rapids HS), senior Courtney Earles of Kentwood (East Kentwood HS) and junior Mari Schoolmaster of Portage (Portage Central HS). The pre-season of returning players includes seven sophomores, five juniors and four seniors. Four players who received All-MIAA honors in 2011 return. Bratschie and sophomore Jenna Grasmeyer of Hudsonville (Unity Christian HS) were All-MIAA first team honorees while Schoolmaster and senior Jessica Maier of Grandville (Jenison HS) received second team recognition. Grasmeyer was also honored as the MIAA's freshman of the year. Sophomore Jillian Sommerville of Plymouth (Salem HS) was voted the team's most improved player. The team's setter, Bratschie in 2011 ranked tenth nationally (NCAA Division III) in assists per set (10.17). Grasmeyer in her first collegiate season as middle hitter ranked 42nd nationally in kills per set (3.78). Hope's DeVos Fieldhouse will be the site of the NCAA Division III finals featuring the eight regional tournament champions on Nov. 15-17.